One big reason to go to the Caribbean during the holidays is that they want you there. This brings the prices down on airfares, hotels, attractions, diving, water sports, shopping and more. You can find special packages all over the islands to encourage holiday travel and visits. During a recent visit to Grand Cayman Island, I discovered that there are a number of reasons to spend the holidays in the Caribbean besides the warmer weather and obvious attractions of a tropical location. Grand Cayman is a small island South of Cuba with only a two-hour flight (you also lose an hour so it feels like only an hour) from Miami International Airport. This small island with a population of only about 20,000 has that small town vibe and sense of community that can make for a memorable holiday experience for you and your family. One big reason to go to the Caribbean during the holidays is that they want you there. This brings the prices down on airfares, hotels, attractions, diving, water sports, shopping and more. You can find special packages all over the islands to encourage holiday travel and visits. In fact, the Fall Only In Cayman packages are available from September 4 through December 17 and perfect for our traditional American Thanksgiving. There also special local holiday traditions of which to take advantage and enjoy. The Friday of Cayman Thanksgiving weekend is a true celebration of all that is Caymanian that is also called Cayman Homecoming. The special weekend gets kicked off with concert event of the year that features the premier Cayman bands and world-class entertainment. Cayman Thanksgiving is a weekend-long national celebration that celebrates and honors Cayman heritage, culture and way of life. It's the Cayman way of showing fellowship among friends, family, neighbors and visitors while expressing thanks and gratitude for the blessings of island life. Cayman Thanksgiving will be December 6th and 7th this year (2014). A special time in the Caymans during the holiday season is the annual Gimistory festival at the end of November. This festival brings together local and international storytellers that travel the island to tell their tales. You will enjoy libation of Cayman-style lemonade and fresh caught seafood, as the incredible tales are told admission free from stages all over the island. Christmas is a wonderful time on the island with lights, trees and decorations all across the island that give a special tropical warmth to the special holiday. And don't worry about shopping, between the shops in George Town to the stores of Camana Bay they have you covered. 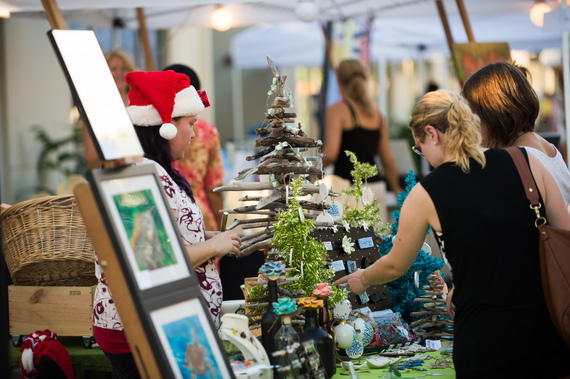 The Farmers & Artisans Market held every Wednesday from 12 noon to 7 p.m. and Camana Bay takes on special holiday flair, as well. 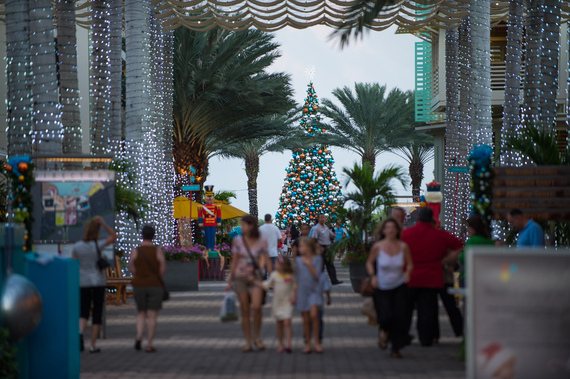 You'll want to visit Camana Bay anyway for their amazing restaurants and to see the island's biggest and most beautiful Christmas tree anyway. They also host another Christmas treat - The Parade of Lights. It takes place on December 1st, and features boats decorated with millions of lights that parade through the harbor. Onlookers enjoy carol singing, local food and drink in what is fast becoming a Grand Cayman tradition. I would recommend sticking around for New Year's Eve, too. Spending the night at one of the swanky resorts or any of the world famous restaurants on Seven Mile Beach is a spectacular way to ring in the New Year. You'll be treated to one of the biggest fireworks display in the world as nothing stands between you and the brilliant aerial display but miles of white sand. So, if you're looking to add a little tropical spice to your holidays, the Cayman Islands or anywhere in the Caribbean my be the way to chase away Old Man Winter and keep the family singing Frosty the Snowman all at the same time. The Islands want to visit, and the package deals are there. Pack your Santa hat and your swimsuit and head south this winter.